*Beautiful black artisan log bin with leather carrier. *Measures 16" Wide X 16 " Deep X 14" High. 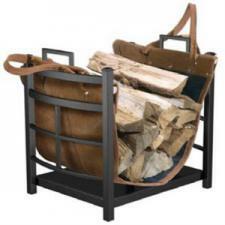 *Leather carrier is great for carrying wood in and placing directly into holder.